I realize I have been utterly impossible to reach online for the past few weeks, and this is because my UK tour conspired against me and the internet. Sometimes it was bad timing, sometimes it was lack of availability, sometimes the UK internet just didn't like my face. It's all water under the bridge, now, though, and I'm back home just in time to be 30. Yesterday I wasn't 30. But today I am. As a present to myself, I re-alphabetized all my shelves. (Also, Lover took me to see Russell Brand last night, and I made cinnamon bread for myself, and I turned in my manuscript for MagicalNovel, and I bought three Madeleine L'Engle novels in hardcover because they would be prettier that way). This particular trip I brought my sister and mother along with, and they frolicked in London while I toured. Despite my rowdy and (to my way of thinking) exceedingly interesting travel stories at the dinner table, they still seemed surprised by what touring actually entailed, so I am going to try to describe the intricacies of touring in a short series of illustrated blog posts over the next week or so. That's the plan. Unless my shelves or cookie dough distract me before then. All right, without further ado. The first step on my UK tour was getting there. This was a bit untidier than usual, as I had to fly to Long Island for an event first (where I procured a recipe for vegan chocolate chip cookies — I am not vegan but you never know when you will need vegan chocolate chip cookies) and then set off the next morning across the Atlantic. The flight is seven hours, but the deadline for MagicalNovel loomed large, and so I made myself busy. 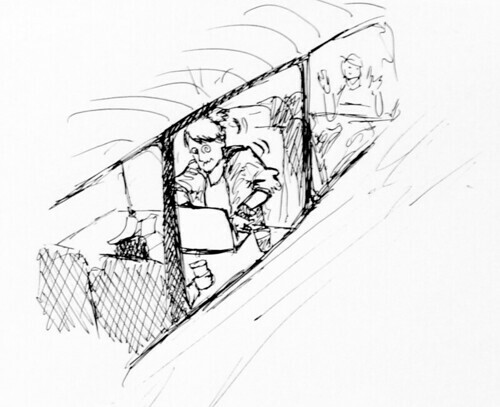 People watch me when I work on planes. Generally, I can ignore this until they laugh at my jokes as I type them. 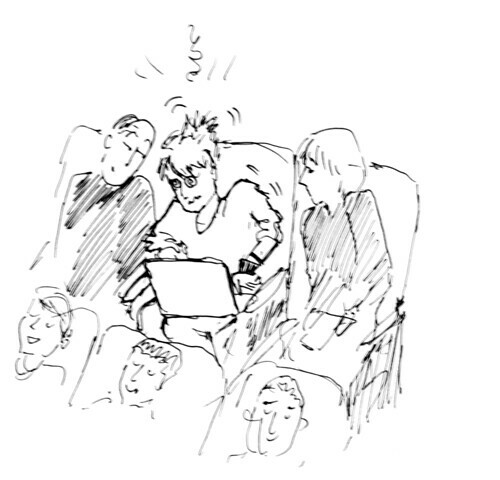 Then I stare meanly at them or type something about the person in the next seat of the plane meeting an untimely death. You see here in this illustration that I am filled with the joy of creating. This is because MagicalNovel is a very difficult novel to write, because all of the characters are complicated people who hate me and want me to be unhappy as I try to write them well. Very soon after arriving in the UK, we had our first public event. And by public event, I mean anything on my schedule that requires me putting on pants and leaving the hotel room. Ordinarily, I view the first of my public appearances with distaste and horror, preferring instead to stay in my bed, but this time, it was a lunch that Scholastic UK had arranged for me and Jonas & Plunkett. You remember those guys, the ones that did the cover of "Summer Girl"? Anyway, both Jonas and (Adrian) Plunkett were delightful. We had lunch at a posh place called The Ivy, which is supposed to be good for spotting stars. Everyone else looked for stars. I looked for another cup of tea, and also I looked at my roast beef right before I swallowed it. Functional Jet Lagged Maggie is Practical. At one point in the meal, I noticed that there was an item on the dessert menu called "Knickerbocker Glory." There was no explanation, as if assuming that all diners would know what exactly a Knickerbocker Glory was. I didn't know. My mother and sister didn't know. I asked Jonas and Adrian if they knew, but it was hard to tell whether they did or not, as Jonas grew very excited at this point and ordered one. When it arrived, it was larger than life. 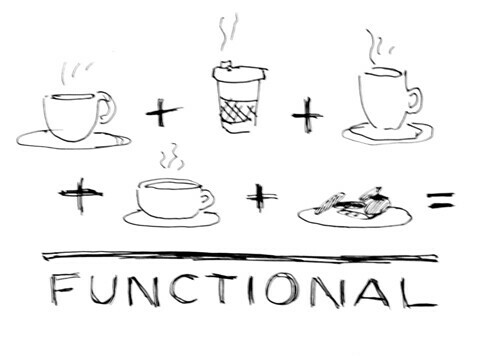 This drawing is true to scale*. 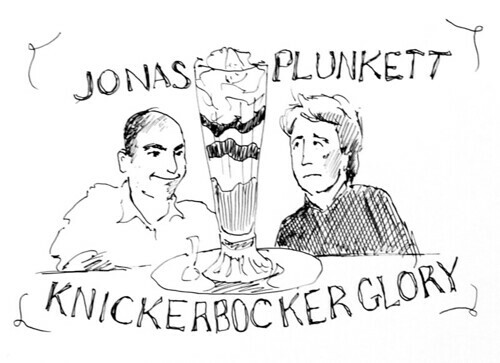 I cannot tell you how much I think Jonas & Plunkett and the Knickerbocker Glory should be the first in a series of children's books. There were no more fun and games to be had after the Jonas & Plunkett lunch. I had an interview in my hotel and then, it was time to head to Swindon for a day of school visits. Not only did this mean I had to put on pants, but I also had to take a several hour train ride from London. This did not displease me, however. Not only are the trains in the UK marvelous things, but this also provided another opportunity for me to attack MagicalNovel before my deadline. You see the thrill in my expression. I knocked out several thousand words before it was time for the school visit. 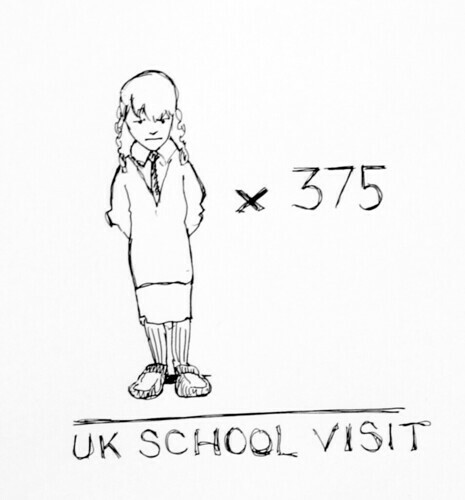 UK school visits, like all school visits, can be somewhat daunting. Generally there are two brands of American school children: "loud" and "emo." That is mostly the same in the UK, except it breaks down more tidily into "cheeky" and "sullen." My job as an author is to make them forget their labels and laugh their heads off. I take this job very seriously. Because otherwise, what I end up with is a very long hour and a lot of pre-teens or teens who would rather be off drinking tea or listening to Jonas & Plunkett. Unfortunately, while I was at Swindon, I contracted some sort of dreadful illness that woke me up in the night with lots of snot and . . . well, that's all. I really think lots of snot on its own counts as a dire condition, especially when you're expected to appear in public every day for the next ten days. The problem with me and cold medications is that I'm allergic to most preservatives and intolerant of the rest, and so I can take cold meds, but it makes my hair fall out. I was very sad to have to take cold meds for the Swindon Flu (that is what I am calling my ailment. Don't try to correct me). It did make me much more presentable in public (although there is video evidence on Youtube of me wiping my nose constantly through the Jonas & Plunkett songs at my London event later in the week) but I was sad about the hairs. Also, it's always a tricky thing buying medications overseas. The packaging never quite seems the same as back home . . .
*****sorry, Swindon. Your teens were actually quite pleasant. Distinctly more on the cheeky side.